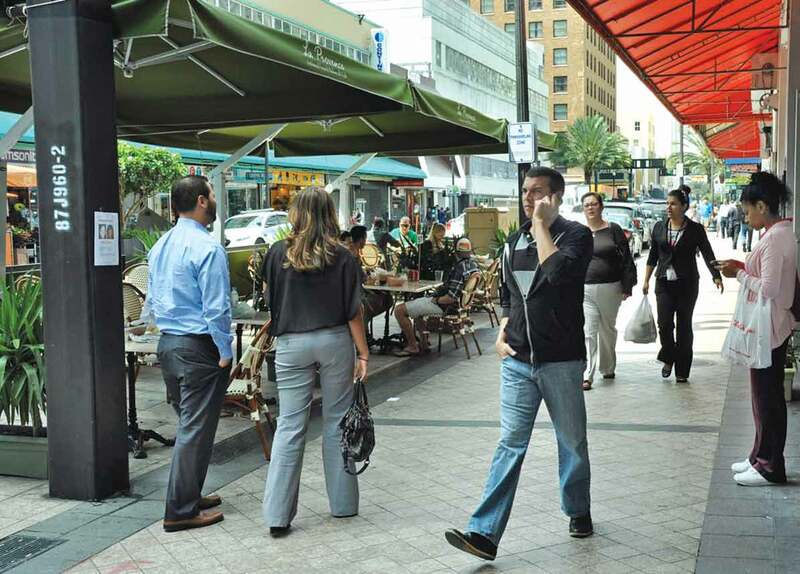 Major improvements to Flagler Street in downtown Miami are just a few steps from commencing. City officials are hopeful a plan to share costs among the city, Miami-Dade County and the Flagler Street property owners in the impacted area will be firm by the end of May. If everything falls into place, actual construction on the Flagler Streetscape could begin before year’s end. “We are very excited about it, and hope to see it come to fruition soon,” said Javier Betancourt, deputy director of the Downtown Development Authority. A major piece of the funding pie was baked just last month at Miami City Hall. Commissioners approved a one-time special assessment on the property owners hugging the iconic roadway in the downtown area. The commission on March 27 approved a special assessment district expected to raise $1 million from property owners along Flagler. The special tax revenue would be combined with $6 million from city and $6 million from Miami-Dade County to fund $13 million in streetscaping to modernize the street and sidewalks and spur economic development. Earlier this year, city officials said all the funding had to come together with a May deadline, because of IRS implications. That’s still the goal and expectation. This week he said he’s not sure when the county’s share will get the OK, but it is expected soon. Mr. Betancourt said he’s been assured by county administration that the $6 million recommendation is headed to a vote of the county commission. “I’m not sure when… but we’re pushing for them to do it earlier rather than later, precisely because of the city’s deadline of late May. I hope and expect it will be coming to the full [county] board at its first meeting in May,” said Mr. Betancourt. Once the city gets the county’s commitment on funding, the project can be bid out, Mr. Betancourt said. The construction documents are ready and waiting, he said. From the time the county approves matching funds, it could take three to four months to determine a winning bid and begin construction. The project is expected to take 18 to 20 months. The street will basically be rebuilt and include wider sidewalks, to encourage cafes and other uses. The street’s new motif will honor and showcase Henry Flagler’s feat in pushing his Florida East Coast Railway past Palm Beach and into Miami in 1896, making it possible to incorporate and grow the community by connecting it with the world to the north. The streetscape plan calls for maintaining Flagler as a two-way street, but constructing crossing gates in a railroad style that could be used to block off portions of the roadway for festivals and special events. Oak trees will be planted along the street for shade, and the work will include fixing drainage issues in the area. The project is to incorporate educational elements as well, offering information about the area’s rich history and Mr. Flagler’s role in Miami’s early years. In 2011 the authority created the Flagler Street Task Force – composed of authority board members and Flagler Street property owners, business owners and other stakeholders – to plan for and oversee Flagler Street’s revitalization. After a series of task force sessions and a week-long public open house, consensus was reached last year on the streetscape design. The authority views the reconstruction of Flagler as both a transportation project and critical economic development step that will create jobs and act as a catalyst for further redevelopment downtown.